One morning in the preschool, four children assembled in our big block area. There were two older children, a boy and a girl, with two younger children, both boys. “I’m not building. I’m drawing what we’re going to make,” an older girl tells me, as three boys haul the big blocks onto the carpeting. She is holding a clipboard, drawing on her paper. Talking louder, directed more toward the boys than me this time, “Then we gotta make OUR house to keep US dry.” It is currently pouring outside and the boys appear not to be listening to her as they build a birdhouse to “keep the birds safe” in the words of the older boy. “OK, guys. We’ll need a long piece – 2.5 inches long. We need more long pieces and a bunch of small ones and…” she continues to give directions that they ignore. – parroting is the extent of the younger boys’ contribution to the dialogue. They contribute muscle power, but ideas and plans for action are absent. The three boys repeatedly state they’re building a birdhouse but there is no cooperation in the construction, nor is there any direction given by the older boy as they continue stacking blocks onto one large pile that lacks stability. Their foundation happens to be our large ramp blocks, which has created a precarious structure. 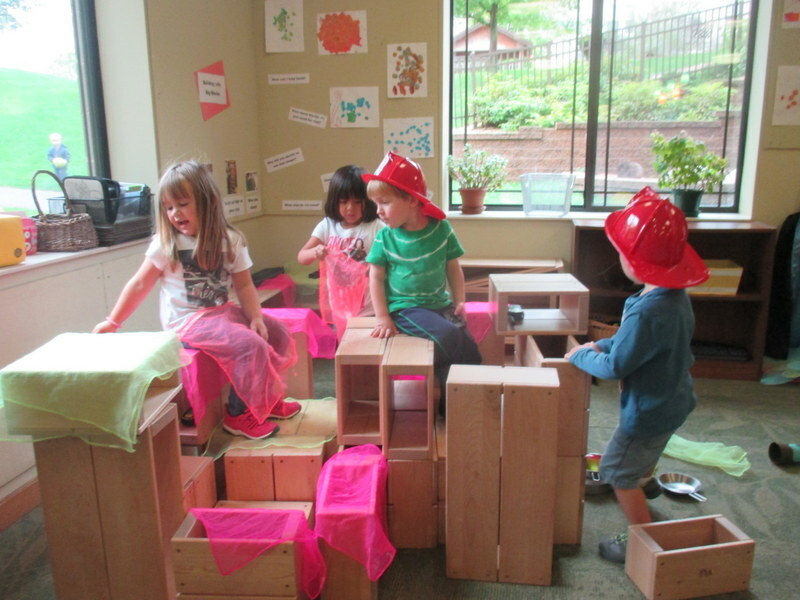 Girl: “But how can it be real when we can’t even get into it?” She gestures at the pile of unstable blocks, impossible to enter like a real house. At this time several blocks start sliding off each other, creating a domino effect. Everyone stops what they’re doing as blocks slide and crash. Older boy: “OK, guys. We need to make a real house now.” He joins the girl to start drawing a model of what they should build next. The younger boys knock the remaining blocks down, satisfied with the noise. Once the blocks are all down, they wait, unsure of what to do next. No ideas are offered. The younger boys go along with the new plan without question. They back up and watch the older ones, trying to figure out what is expected. “We need flat blocks so they don’t all fall.” The younger boys begin collecting the square and rectangular blocks to build a base, and the structure grows, though not as big or as disorganized as the first one. When one younger boy grabs a ramp block for their house, it is immediately rejected by the older children. “No. Only the flat blocks.” They continue building until the older children are satisfied. The group of four heads into the kitchen area. Together they collect plates, bowls, and play food to carry back to their new house. They set a table and sit down to a feast, at which time the younger boys finally begin to speak. “This is delicious!” “Who wants more pizza?” Now everyone is in their comfort zone, and no direction is needed from the older children. Everyone knows what to do at dinner time! “The children enter school not even knowing names, yet ready to step into each other’s dreams.” Vivian Paley, a much lauded early childhood educator and author. Our staff had the great fortune of meeting with Vivian in Chicago last year, thanks in large part to Sarah Sivright’s personal and professional relationship with her. She is a hero in our field of early childhood education. The start of a school year is filled with newness. 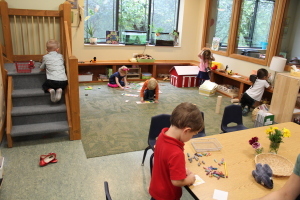 For a preschooler at All Seasons, the initial conference before day one helps to eliminate some aspects of the unknown. They have seen their room, and what the teacher knows is past the starting line, having had time to discuss children’s backgrounds with parents. But what each child faces is still daunting – from new peers to meeting seniors, from hiking in the woods to figuring out the soap dispenser, and from working as a community to communicating individual needs. In the midst of all the new experiences and expectations, teachers are observing closely. We are looking for strengths and paths to provide guidance. We are watching to learn each child’s comfort level, so we know when to gently nudge them past it. We are taking notes to record where they are developmentally, which in turn become records of growth. You may be wondering what exactly we are looking for and what we are writing down. Well, for now we are simply writing a narrative of what we see and hear. We meet each child where they are when they come, and as our notes and observations grow, the next step is to look for patterns. At the Fall Conference, we will again talk with parents to discuss hopes for the year and potential concerns, as well as actions needed to address them. 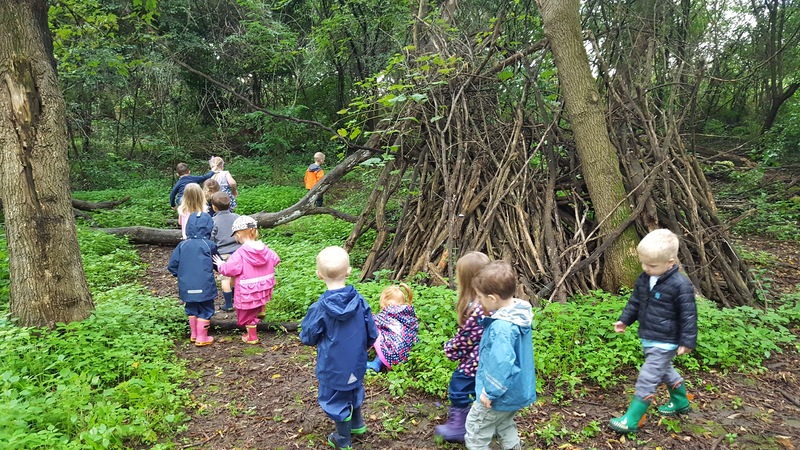 We will share what we’ve noted, with a focus on the child’s social and emotional development, their approach to discovery and their physical and motor skills. The emphasis at this age is on social and emotional growth. It is through our observation of their play that we can gain the fullest understanding of where they are and what they need next.